The Model 991 interior door has a strutless design feature to help lessen operational noise and also has a patent-pending curtain lock, which lets the door hold up against a lot of pressure and can be quickly repaired in the field. The Model 992, which is made of the same curtain material as the 991, has struts that work for larger door sizes, while also having easy-to-replace sections. The Model 993 and 994 both have strutted high speed fabric doors, but they feature a heavier curtain material for exterior applications. Both have been independently tested for pressure resistance. Model 993 has a pressure resistance of up to 4.0 psf or 76 mph, and Model 994 has a pressure resistance of up to 22 psf or 158 mph. Model 994 also has a patent-pending bottom wind lock and roller wind struts, which can reduce operational time, while also allowing the door to hold up against a lot of pressure. All RapidFlex™ High Speed Fabric Doors have two sets of infrared obstruction detection, reversing wireless safety edges, breakaway and self-reset, and an industry-leading 5 year door system warranty. The Model 991 is great for separating large controlled spaces, like food and beverage facilities, high traffic zones, storage areas, and manufacturing rooms, or areas where it’s necessary to prevent cross contamination. It features dual recessed photo eyes and a patent-pending curtain lock and can withstand high pressure and allows for quick repairs in the field. Excellent for manufacturing, distribution, food and beverage, cold storage, and pharmaceutical facilities. The Model 992 is a heavy-duty, strutted interior high speed fabric door with an independently tested static pressure resistance of about 76 mph and a dynamic pressure resistance of about 53 mph. It has industry standards for safety and includes a reversing edge, two sets of infrared object detection sensors, and one door stop device. The RapidFlex™ Model 992 high speed strutted rolling fabric door is excellent for manufacturing, food and beverage, cold storage, warehouse, and distribution facilities. The Model 992 high speed door features a spring-less design for minimal interruption and maintenance, a mounted gear drive, which helps minimize wear and tear, and a variable frequency drive that minimizes sudden jolts when the door starts and stops. It also has a strut design that allows for fast fabric section replacements and the struts also help to reduce curtain deflection when/if the door is under pressure. This model also provides a low maintenance solution with it’s break-away design, impact detection features, push button self-repair, and plug-and-play wiring that reduces the need for a licensed electrician. The Model 993 is an exterior high speed fabric door with struts that has been independently tested for a static pressure resistance of 76 mph and a dynamic pressure resistance of 53 mph. It has industry standards for safety, including a reverse edge, two sets of infrared object detection sensors and one door stop device. It is excellent for parking garages, manufacturing, warehouse, and distribution facilities. This model also has a springless design, which means less interruption and less maintenance. It also comes with a mounted gear drive to minimize any wear and tear, and features a variable frequency drive to eliminate the sudden jolts that can happen when a door is started or stopped. The Model 993 is made of a tough curtain material. It has three layers of PVC-coated polyester and two layers of polyester weave. It also has a strutted design, which helps reduce curtain deflection and is easy to replace quickly if there are damaged sections. This RapidFlex™ door is also a low maintenance solution because of its break-away design that features impact detection and push button self-repair. In addition, it has plug-and-play wiring that doesn’t require the need for a licensed electrician. 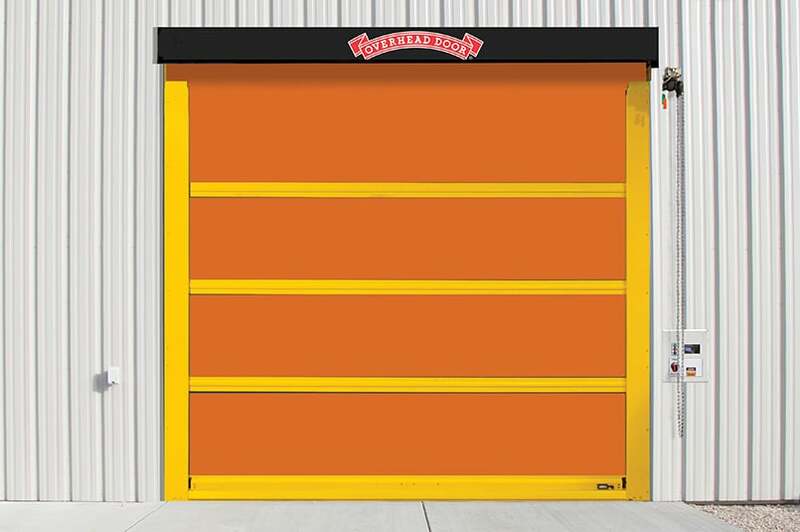 The RapidFlex™ Model 994 is a heavy-duty exterior high speed fabric door with struts that are great for large openings and suited for manufacturing, mining, auto, transit, and parking garage applications. It has industry-leading pressure resistance features that have been independently tested for a static pressure resistance of 158 mph and a dynamic ultimate pressure resistance of 75 mph. It also includes industry-leading standards for safety, like a reversing-edge, two sets of infrared object detection sensors, and one door stop device. It’s excellent for parking garages, mining, auto, transit, and manufacturing facilities.